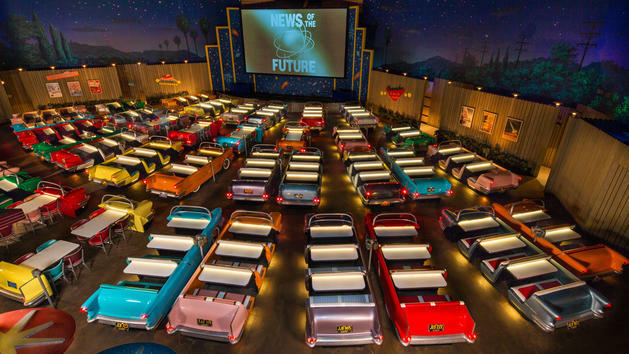 It was only a matter of time until someone took Disney’s Sci-Fi Dine-In Theater at Disney’s Hollywood Studios and turned it into a stand-alone concept. For those unfamiliar, the restaurant has been a favorite at DHS since the park opened in 1989. Diners relax in recreations of classic cars while watching clips from vintage sci-fi flicks. Now a similar concept is opening in Nashville and it seems to be a step up. August Moon Drive-In is a $10 million investment, taking a page from ultra-themed dining locations like the Sci-Fi Drive In and immersive theater like Sleep No More. Patrons will enjoy artisanal spins on classic ’50s diner fare like hamburgers and milkshakes while sitting in recreations of vintage cars in a 40,000-square-foot facility covered by a dome. August Moon is the brainchild of Michael Counts, who’s projects we have covered many times here at Theme Park University including Paradiso, The Walking Dead Experience and The Ride. The screen will be tricked out so performers can interact with the audience before and after films. Movies will be a combination first-run theater flicks and classic ones that fit the style of a drive-in movie theater. The entire experience for a 90-minute film will take about three hours, which includes time to explore the space, dining and the movie itself. Prices are expected to range from $8 to $22, with food being an additional charge, of course. August Moon Drive-In is expected to open spring 2018 and we can’t wait to see the finished project! This entry was posted in Outside The Parks and tagged August Moon Drive-In, Disney's Hollywood Studios, Drive-In Movie, movie theater, Nashville, Sci-Fi Drive In Theater. Bookmark the permalink. Trackbacks are closed, but you can post a comment.